My understanding is that current GA piston engines from Continental and Lycoming are based on a design from the 1960's. There have been many evolutionary improvements, but only within the limitations of those 1960's designs. They are large displacement (~1.5L/cylinder), run at RPMs in the mid 2000s range so that they can spin the prop at optimal rates without using a gearbox, and they are air cooled to save the weight and complexity of a liquid cooling system. What would a completely new, designed from the ground up GA piston engine look like today? Factoring the massive improvements that have been made in all sorts of engines over the years in non-aviation applications- for autos, trains, boats, generators, etc. Would they still operate at such low RPMs? Yes reliability and durability are still major concerns, but manufacturing tolerances are so many times smaller now then they were in the 1960s (possibly allowing for reliable operation at higher RPMs), and they are now mounting fixed gearboxes to commercial airliner turbine engines so adding a fixed gearbox to a GA piston engine should be trivial. Would they still be air cooled? Yes it can still save weight, but possibly at the cost of extra cooling drag, and definitely at the cost of much more finicky operation that requires the pilot to carefully monitor engine temps throughout their flight cycle. Would they still be in a flat engine arrangement (flat 4, flat 6, etc.)? I would imagine so, I can't imagine an alternate piston engine arrangement with the smoothness, packaging, and scalability advantages of the flat architecture. Straight engines get too long, and V engines require many more changes to scale the number of pistons up or down. Would they still fly on spark-ignited gasoline-type fuel, or could compression ignition based on jet fuel produce the power density and reliability required? I realize that the single largest factor in this area might be the simple availability (or lack thereof) of fuels, but I am talking about purely from an engineering perspective. Suppose we are talking about North America where both Avgas and Jet A are widely available, what would be the superior fuel for flying GA piston engines? What other differences might there be that I haven't considered? It would have a gearbox between the crankshaft and the propeller. That is certain. This would enable it to run constantly at about 4000 RPM and create the same power from a smaller displacement. The consequence would be a more compact and lighter core engine. Compared to a car engine, the cooling system would be more capable, so the weight would still be higher than that of a car engine of the same nominal shaft horsepower. But it should be lighter and allow for a more aerodynamic cowling than the current piston aero engines. The Porsche flight motor (PFM 3200) was like that, and for a reason. Yes, it did not outperform the older engines in terms of mass, but it was noticeably less noisy. Starting from a dated six-cylinder boxer design, the engineers could not fully optimize the engine for its intended purpose. 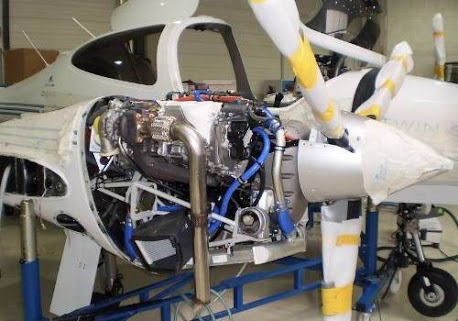 Once a gearbox is fitted, it makes sense to reduce propeller speed, so the diameter of the propeller fitted to that engine would be a bit larger than that of a comparable propeller on a conventional engine. Once Jet-A is widely available at GA airfields, a diesel version would also be very likely. Note, however, that the system weight of a piston engine (engine + accessories + fuel system + fuel) will be higher for a diesel on short ranges. It would look almost identical mainly because the engines are designed around a use case not for purely engineering pursuits. You may see some different material choices, some changes in piping and head design as our understanding of these topics has improved and our production abilities have come a long way but ultimately little change. You should read the answers here, and here. They are almost duplicates but more focus more on why modern car engines are not used in aviation. Although in some cases they are. Piston GA engines with reductive gear boxes were attempted in the 80's on the Mooney M20 PFM ultimately the project was such a failure Mooney paid to replace all the engines with continentals. As @RonBeyer mentions in the comments the low RPM is a function of the propellor not the engine. Aircraft engines simply have a different use case than automotive engines which has kept them simpler over the years. The cost of certification (a huge factor in aviation) has also kept up rapid innovation at bay. Some modern piston diesels are already certified to run on Jet A. This article says it pretty much as well as I can and is worth the read. Something that is perhaps overlooked is that aircraft engines are not subject to the same regulations that automotive engines are. As such they are, in some cases actually more efficient. One major thing that impacts car engines efficiency is catalytic converters and mufflers, something GA planes dont really have. As such there has never been a reason to compensate for the performance loss as a result of regulations. You also mention "more reliable", GA engines are quite reliable and the FAA/NTSB has reported that mechanically related accidents are on a general down trend if we look back at history. Modern machining and industrial practices can be used to make old engines in a more reliable and consistent way. One major efficiency boost that has been realized on the ground is turbo charging. While there are plenty of turbo aircraft out there the prevailing attitude in aviation has always been to keep things simple. Less parts means less to fail as such there is simply a smaller market for a turbo aircraft engine. It is not that the technology is a mystery to the makers or the consumers its simply an unwanted complexity. a car engine basis, in the AE300 case a Mercedes diesel. running on diesel or kerosene (Jet A1). Not the answer you're looking for? Browse other questions tagged aircraft-design general-aviation engine piston-engine engine-design or ask your own question. Can a Diesel Aircraft engine be run on Car Diesel?